Defiant Sudanese President Omar al-Bashir said Monday that ongoing protests will not lead to a change in government, as he addressed a rally of cheering supporters in war-torn Darfur. "Demonstrations will not change the government," Bashir told crowds of supporters gathered in Niyala, the capital of South Darfur state, where just a day ago police had broken up an anti-government demonstration, state television reported. Deadly protests have rocked Sudan since December 19 when angry crowds took to the streets in towns and villages against a government decision to raise the price of bread. At least 24 people have died in the protests, which swiftly turned into nationwide anti-government rallies, with protesters calling on Bashir to step down. 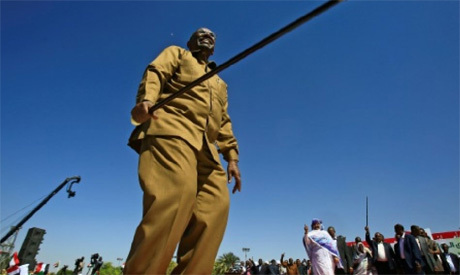 "Sudan has many enemies and those enemies have few people among us who don't want stability and security," said Bashir, with state television broadcasting footage showing him waving his trademark cane as supporters chanted "stay, stay". "We will not allow anyone to destroy our homeland by looting and burning our properties," said Bashir. In the initial days of protests, several buildings and offices of Bashir's ruling National Congress Party were set on fire in towns and villages. On Sunday, the first anti-government demonstrations were held in Niyala and El-Fasher, the capital of North Darfur. Darfur, a region the size of France, has been torn by violence since 2003 when ethnic minority rebels took up arms against Khartoum's Arab-dominated government, accusing it of economic and political marginalisation. About 300,000 people have been killed in the conflict and another 2.5 million displaced, according to the United Nations. Most of those displaced still live in sprawling camps. The Sudanese President and supporters have denied responsibility for the suffering in Darfur and blamed the strife on competing tribes and ethnic groups over power. On Monday, he reiterated that Sudan faced "economic problems," but they could not be solved by looting and burning of properties. Sudanese security agents, meanwhile, stopped a group of journalists in Khartoum from holding a sit in to protest the banning of a newspaper this week, witnesses said. The journalists were planning a sit in after authorities banned Al-Jadida newspaper from publishing for several days this week, a witness told AFP without offering details. Organisers of anti-government protests have so far staged hundreds of rallies across the country, including in Khartoum. The Sudanese Professionals' Association that is spearheading the rallies have urged protesters to continue with their demonstrations this week, calling it as the "Week of Uprising". On Sunday, protesters had taken to the streets in the capital's Bahari district chanting "peace, peace" and "revolution is the people's choice," but they were quickly confronted by riot police with tear gas.